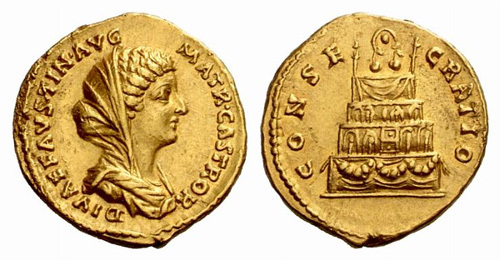 Annia Faustina, daughter of the elder Faustina and of Antoninus Pius, was married to Marcus Aurelius in A.D. 145, and she died in a village on the skirts of Mount Taurus in 175, having accompanied the Emperor to Syria. Obverse: FAVSTINA AVGVSTA, Draped bust right. Reverse: AVGVSTI PII FIL, Diana standing left, holding bow and arrow. Obverse: FAVSTINA AVGVSTA, Draped bust left. Obverse: FAVSTINA AVG PII AVG FIL, Draped bust right. Reverse: CONCORDIA, Concordia standing looking right, holding cornucopia and raising robe. Reverse: CONCORDIA, Dove standing right. Obverse: FAVSTINA AVG PII AVG FIL, Draped bust left. Obverse: FAVSTINAE AVG PII AVG FIL, draped bust right. Reverse: IVNO, Juno seated left on stool, feet on footstool, holding young child, who turns to view her, on her right knee with her right hand, and cradling long sceptre in left arm; child standing right before holds up two grain ears to child on knee, who extends right hand to receive them. Obverse: FAVSTINAE AVG PII AVG FIL, draped bust right with band of pearls round head. Reverse: IVNONI LVCINAE, Juno standing left, holding patera in right hand and long sceptre in left. 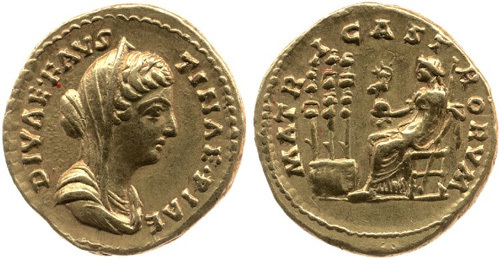 Reverse: LAETITIAE PVBLICAE, Laetitia standing to left with wreath and sceptre. Obverse: FAVSTINAE AVG PII AVG FIL, draped bust right wearing stephane. Obverse: FAVSTINAE AVG PII AVG FIL, Draped bust of Faustina II right, her hair bound with a band of pearls. 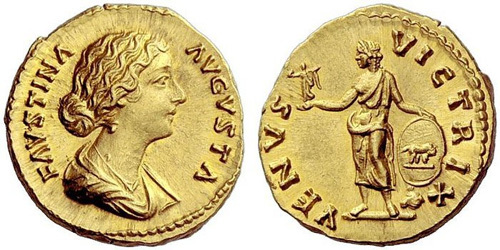 Reverse: VENERI GENETRICI, Venus standing left, holding apple in her right hand and long scepter with her left. 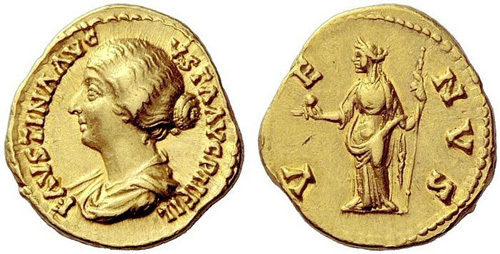 Reverse: VENERI GENETRICI, Venus standing left, holding sceptre in left hand and extending right. Reverse: VENERI GENETRICI, Venus standing left, holding apple and a swadeled infant. Obverse: FAVSTINA AVGVSTA AVG PII FIL, draped bust left, hair coiled on back of head. Reverse: VENVS, Venus standing left, holding apple and sceptre. Obverse: FAVSTINA AVGVSTA AVG PII F, draped bust left, hair coiled on back of head. Reverse: VENVS, Venus standing facing, head left, holding apple and rudder with dolphin entwined. Obverse: FAVSTINA AVGVSTA, Draped bust right, hair pulled back and tied in bun behind neck. 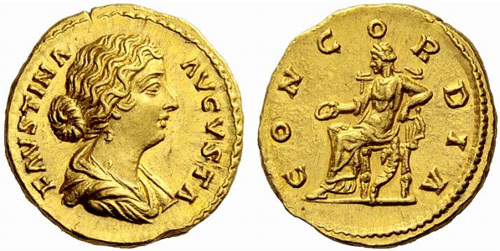 Reverse: CONCORDIA, Concordia seated left, holding patera in right hand and resting left elbow on chair; under chair, cornucopiae. Obverse: FAVSTINA AVGVSTA, Draped bust left, hair pulled back and tied in bun behind neck. Reverse: DIANA LVCIF, Diana Lucifera standing left, holding transverse torch in both hands. Reverse: FECVND AVGVSTAE, Fecunditas standing left between two girls and holding two infants in her arms. Reverse: FECVNDITATI AVGVSTAE, Fecunditas, draped, standing right, holding infant; at left and right, a child reaching up. Reverse: FECVNDITATI AVGVSTAE, Fecunditas, draped, seated right on low seat, holding a child on her lap; at left and right, a child standing. Reverse: FECVNDITATI AVGVSTAE, Fecunditas seated right on chair, holding child on lap; child standing to left and right. Reverse: HILARITAS, Hilaritas standing left, holding long palm and cornucopiae. 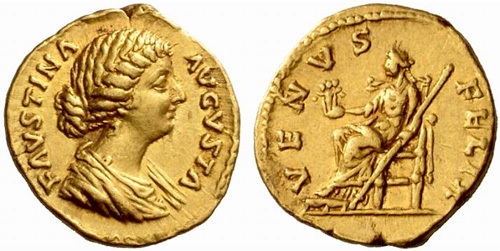 Obverse: FAVSTINA AVGVSTA, Diademed bust right, hair pulled back and tied in bun behind neck. Reverse: IVNONI LVCINAE, Juno standing left, extending right hand, holding child in left arm; a child standing to either side, raising right hand. Reverse: LAETITIA, Laetitia standing left, holding wreath and sceptre. Reverse: MATRI MAGNAE, Cybele seated right, leaning forearm on arm of throne and holding tympanum on knee; at side, lion seated right. 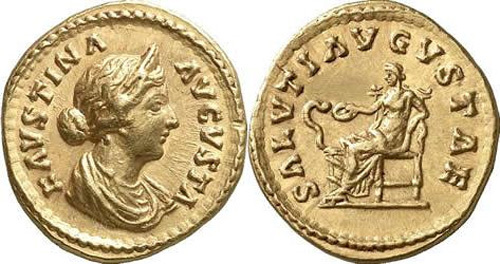 Reverse: SALVTI AVGVSTAE, Salus enthroned left, feeding from patera held in her right hand a snake coiled around altar, resting left arm on throne back. Obverse: FAVSTINA AVGVSTA, Draped bust right, diademed, hair pulled back and tied in bun behind neck. 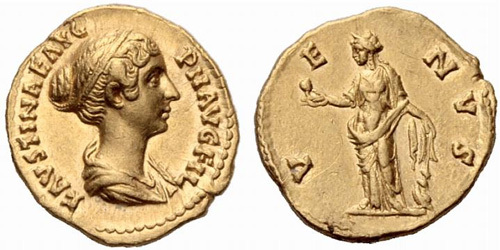 Obverse: FAVSTINA AVGVSTA, Draped bust right, hair pulled back and tied in bun behind neck, circlet of pearls on head. Reverse: TEMPOR FELIC, Fecunditas standing facing, head left, cradling infant in each arm, two older children standing on either side. Reverse: VENVS FELIX, Venus seated left, diademed, holding group of the Three Graces and a sceptre. Reverse: VENVS GENETRIX, Venus, draped, standing left, holding Victory in extended right hand and resting left hand on shield, at left, captive. Obverse: FAVSTINA AVGVSTA, Draped bust right, hair waved, pulled back and tied in bun behind neck. 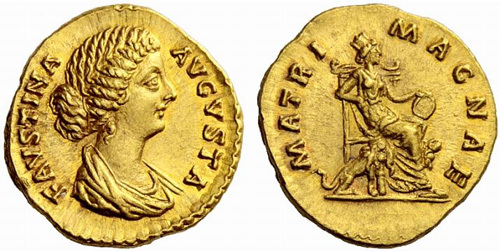 Reverse: VENVS VICTRIX, Venus standing left, holding Victory and leaning on shield, decorated with she-wolf with twins, set on ground over helmet. Obverse: DIVAE FAVSTIN AVG MATR CASTROR, Draped bust right. Reverse: CONSECRATIO, Funeral pyre surmounted by biga. Obverse: DIVAE FAVSTINAE PIAE, Draped bust right, veiled and diademed. Reverse: MATRI CASTRORVM, Faustina, draped, seated left on low seat, holding globe surmounted by phoenix in extended right hand and sceptre in left hand; before, three standards.